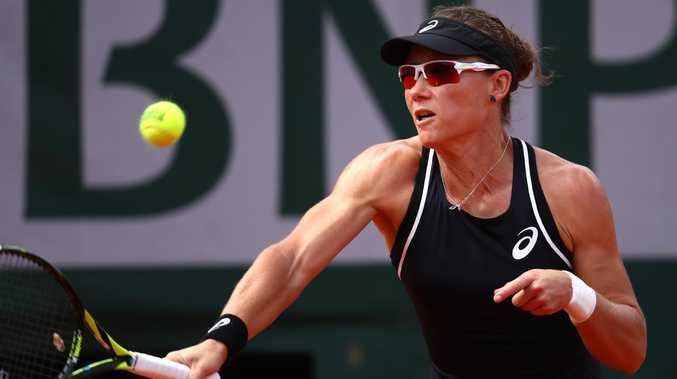 Sam Stosur suffered a heavy defeat to Garbine Muguruza. SAM Stosur will use her humbling demotion from the world's top 100 as a spur to reclaim a place among the elite. The US Open winner will drop to beyond 100 when the rankings are updated post-tournament after a heavy 6-2 6-0 French Open loss to Garbine Muguruza. "I think I'm probably dropping out of top hundred now, I think, but anything from here on is going to help," she said, pointing to the fact she has virtually no points to defend until season's end because she missed much of last year with a hand injury. "So I'm definitely motivated," she said. "So we've got a bit of thinking to do tonight, but I definitely intend to keep going and try to really get myself back where I think I'm capable of being. "To be honest, right now, I'm less concerned about it now than what I probably was in March-April at the start of the clay court season," she said. "I knew going into this time of the year it was pretty crucial for me to, obviously, win matches. "It would have been nice to do a bit better in Madrid and Rome where there's big points up for grabs but it's over now and, yeah, whatever I end up being, I am. And now I can kind of just build from there. "But to be honest, now that it's happened, it's not as bad as what I thought it was going to be." The former world No 4 will contest Mallorca and Eastbourne before Wimbledon before returning to her favourite clay. The Queenslander has not dropped out of the top 100 in more than a decade. She was battered by Murguruza's searing opening, as the Wimbledon champion claimed the first eight games. The Spaniard broke Stosur's serve six times in seven service games. "I was surprised in a way, because I knew it was going to be a battle," Muguruza said. "The last match (in Brisbane was), three sets, I'm very happy this time it was not as dramatic as the previous one. "She plays well. Maybe it wasn't her best day. But I'm happy." Daria Gavrilova in action against Elise Mertens. Aussie Daria Gavrilova will turn her focus to British grass after a crushing 6-3 6-1 loss to Belgian Elise Mertens. The Victorian lamented never hitting her straps in Paris, despite reaching the third round here for the first time. "I felt like the whole tournament I did not play my tennis. And I think Elise was playing really well, and she's really confident." she said. "But, yeah, just couldn't find a way, and I was too passive. I was running three metres behind the baseline and, yeah, just wasn't aggressive at all. "Yeah, it's obviously a better outcome than last year's. "But I said to my coach, I'm still disappointed that I couldn't find a way to play free. And, yeah, I just haven't been playing as well as I've been practising, but I think I'll find a way. "And I'm still learning. So hopefully next slam will be easier, and I'll just try and play my game and play free. Gavrilova will contest Birmingham and Eastbourne in preparation for Wimbledon.